This note was originally published at 8am on November 10, 2011. INVESTOR and RISK MANAGER SUBSCRIBERS have access to the EARLY LOOK (published by 8am every trading day) and PORTFOLIO IDEAS in real-time. I didn’t have a chance to watch the Republican Debate last night, but woke up to an email from a Republican operative contact intimating that Gingrich will benefit from Perry leaving the race. This particular contact has been a vociferous supporter of Perry, so I was surprised by his comment. After reviewing the transcript and key highlights this morning, I understand his point quite clearly. To Cicero’s point in the quote above, Perry will certainly remember his blunder, even as he couldn’t remember the three agencies. Normally, one bad exchange in a debate wouldn’t ring the death knoll for a candidate’s campaign. In the case of Perry, his campaign was already on life support. As we highlight in the Chart of the Day, the InTrade contract for his gaining the Republican nomination is now at 4.1%. Not only is this the worst rating since he fully launched his campaign, but Perry is now trailing the embattled Herman Cain who is at 5.6%. In general, last night’s debate likely will not alter the overall makeup of the race for the Republican nomination. This is still Romney’s race to lose, and in a big way. On InTrade, Romney is at 71%, while his second closest rival, Newt Gingrich, is at 9.1%. In head-to-head polls amongst all the leading Republican candidates, Cain has led in some recent polls, but in aggregate since early October, Romney has either been first or second in every poll. Finally, Romney has the money and team to stay deep in the war of attrition that is the Republican primary season. Assuming Romney does get the nomination, the question is whether he can beat President Obama in a head-to-head matchup. So far, at least, the numbers suggest that Romney will be the underdog in that matchup. Currently, according to the Real Clear Politics poll aggregate, Obama, on average, beats Romney by +1.7 points. To be sure, this is within the margin of error, though much closer than one would expect given Obama has an approval rating in the mid-40s and unemployment has a 9-handle. Ultimately, as usual, turnout and motivation will be key and if the midterms were any indication, Republican turnout could be huge. Flipping back to the market, undoubtedly yesterday was a day most investing minds would prefer to forget. The SP500 was down -3.7% yesterday. In particular, breadth was notably negative with one stock up on the day. That stock was Bed, Bath and Beyond and the catalyst was a positive call from Cleveland Research. If Cleveland Research is moving a stock, this is probably a decent flag for another important risk factor: light volume. No surprise, to Hedgeye at least, financials were the weakest sector with the XLF down -5.4% on the day. Coincidentally, or not, our Financials Sector Head Josh Steiner held a call with Peter Atwater (former Treasurer of Bank One) yesterday to discuss the key new risks for financials. Both Steiner and this industry veteran continue to believe that investors are underestimating the long term risks to financials, with Jeffries and MF Global potentially being canaries in the coal mine related to bank hedging. 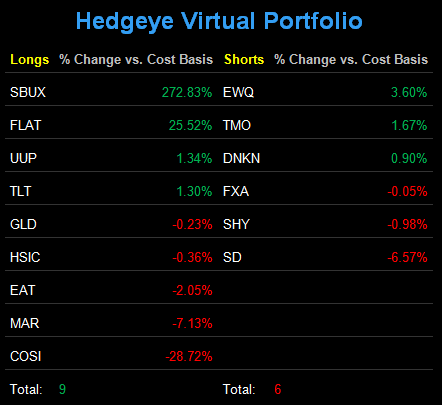 If you’d like access to our Financials sector and a replay of the call, email sales@hedgeye.com. In Europe, the news and data flow appears to be going from bad to worse. Front and center is the Italian bond market. Italy sold €5 billion of 12-month bills this morning with average yield of 6.087%. This compares to Italy’s last auction October when it sold the same duration of bills at 3.57%. Further, Italian 10-year yields remain above the 7% line. The Italian Senate is purportedly “rushing” to pass austerity measures with a vote tomorrow. The likely outcome of incremental Italian action is accelerating stagflation in Europe. On the last point, the EU lowered its Euro-region growth forecast due to the worsening debt crisis from +1.8% growth in 2012 to 0.5% growth. Our view continues to be that European growth will likely be negative as inflation begins to accelerate alongside the eventual hum of the ECB printing presses. Our view of Europe underscores one of our top macro ideas heading into 2012, which is to be long the U.S. dollar. We will be holding our annual best ideas call tomorrow at 11am eastern. This call will represents the best ideas, both long and short, across all seven of our coverage sectors. We will be circulating all the materials to institutional subscribers later today. For those that aren’t current Hedgeye institutional subscribers, please email sales@hedgeye.com for details around gaining access to the call.